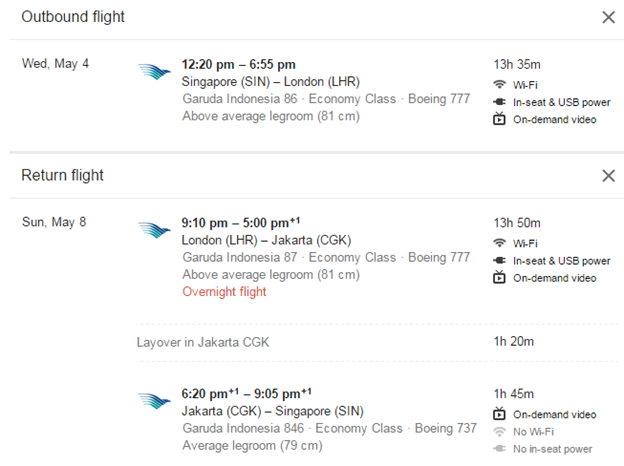 Starting 31st March 2016, Garuda Indonesia has started flying direct 5 times a week (every other day except Monday and Friday) from Singapore to London (Heathrow) one way basis. The airline has done this due to the ongoing runway issues at the Jakarta airport which limits the take-off weight from the airport. The airlines 77-300ERs are exceeding the runway restrictions on full load. The airline is marketing this one-way flight big time to gauge market interest given that it is competing against the likes of every big airline that is directly or indirectly flying this route. The airline, based on the response it gets to the flight may make this flight a permanent feature should it get a strong uptake although its limited by the fact that as of now it’s just a one-way arrangement and the return leg still flies directly to the Jakarta airport with a connecting flight bringing you back to Singapore. Garuda Indonesia is one the examples of a remarkable turnaround by an airline that has revitalized its fleet and has more than 100 new planes added to its fleet with less than 5 years of age. The average age f their fleet is 5.4 years and with a superb cabin experience, they offer a great experience. This is definitely a good chance to snag good fares on a long haul route and experience a new product.